Synopsis: Before the attack, sixteen-year-old Tom Harvey was just an ordinary boy. But now fragments of a shattered iPhone are embedded in his brain and it’s having an extraordinary effect . . . Because now Tom has powers. The ability to know and see more than he could ever imagine. And with incredible power comes knowledge – and a choice. Seek revenge on the violent gangs that rule his estate and assaulted his friend Lucy, or keep quiet? Tom has control when everything else is out of control. But it’s a dangerous price to pay. And the consequences are terrifying . . .
iBoy. I know- it sounds cheesy. I was reading iBoy at school, and my friends were laughing at how bad it sounds. All I can say is that it does not reflect the book quality wise, in any way. 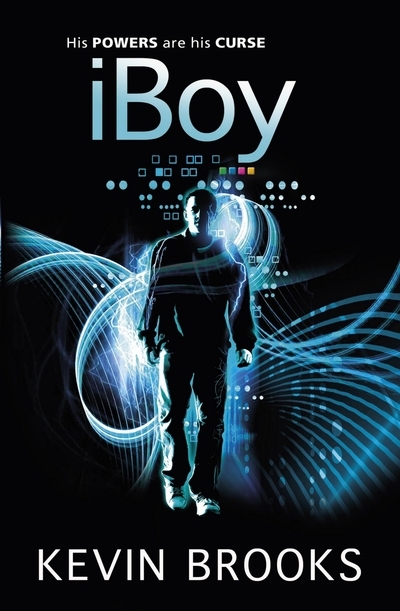 iBoy is a great book- full of action, extremely tense and with a tragic setting, this is absolutely a boys book. That’s not to say girls won’t enjoy it; just that I’m sure any guy who reads iBoy is sure to love it. I haven’t read any of Kevin Brooks’ previous novels. Apparently, he’s quite famous (the Press Release dates that Kevin Brooks is “one of Britain’s most acclaimed writers for teens”). I’m sure I’ve heard of him, but I don’t remember, so I was completely unaware of what to expect. All I can say is I was blown away, and from the very beginning. Now, I realise what the publishers were talking about! It is truly astonishing. The novel opens in quite an odd way. An odd, but highly effective way. There’s no waiting around- it’s straight into the action. Because it’s written in First person, there is an immediate connection between reader and Tom Harvey, the main character. There’s no need to introduce him; it is unnecessary. The immediate connection means the author doesn’t have to waste a chapter explaining who Tom is. We know what he is like from the first sentence. The way he talks and expresses himself instantly introduces us to him. This leads me straight on to the characters. Fascinating characters, they are too. Characters that leave us questioning our own morality, as well as the morality of the people the characters represent. It’s an intricate battle that really makes you think, as this isn’t just good vs evil. Very much like the real world, nearly everyone is a shade of grey, doing what they are because of their own morals. The emotional journey is very much similar to the one Batman/Bruce Wayne goes through in the 2008 blockbuster The Dark Knight: with ability to be a vigilante, is what Tom is doing right? Do the gangs deserve to die? The internal turmoil that happens within Tom is great- I don’t think I have ever read a book that so questions right and wrong so well and so accurately. The story is addictively fast paced. It’s almost compulsive, how iBoy makes you read it. I was reading it at every moment I had to spare!. iBoy is also incredibly cinematic. I had no problem visualising what was happening. Quite the opposite: I was finding it hard not to! If a book can make everything seem that real, then you know it’s a good book, and I won’t be surprised if there is a film adaptation of iBoy sometime in the future. iBoy is a perfect novel for us guys; it has a love interest, it has action, tension and emotion. I’d be surprised to find someone hate it, if I’m perfectly honest. It truly is an astounding book. What did you think about iBoy? I didn’t think I’d like it but it was actually really amazing. I honestly could not put it down once I started, because I loved every minute; and I pretty much agree with you own review. Thank you for allowing me the chance to read it. It does take an amount of suspended disbelief to start with, but once it gets going it really is an excellent book. And that’s fine- having competitions is fun!